Is This a Service Animal, Therapy Animal, or Pet? It has become apparent that pet owners are interested in taking their pets with them everywhere they go. Some hotel chains are making exceptions for pets. There are pets in businesses and public venues that I have not seen before. I believe that we are going to see more opportunities for pets in public places in the future. Yet we must be cautious not to infringe on the rights of those working dogs that are essential for the disabled and/or handicapped to carry out their day to day routines. We are seeing an increase number of people indicating their “pet” is a therapy animal, service animal, or emotional support animal. Yet there is much confusion and misunderstandings about what the differences are. I am going to share some basic information and then encourage you to ask more questions and find out more details if there are situations that you are finding yourself or someone you love in. A service animal means any dog that is individually trained to do work or perform tasks for the benefit of an individual with a disability. A disability can include a physical, sensory, psychiatric, intellectual, or other mental disability. An emotional support animal is a companion animal that a medical professional (licensed mental health professional) has determined provides benefit for an individual with a disability. A therapy animal has been obedience trained and screened for its ability to interact favorably with humans. Their primary purpose is to provide affection and comfort to people in hospitals, retirement homes, nursing homes, schools, etc. 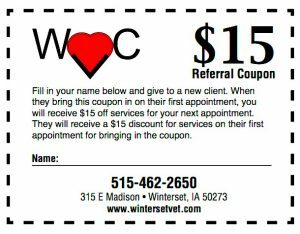 At Winterset Veterinary Center we have been asked to write letters indicating a pet is an emotional support or therapy animal. We are not licensed to make that decision so we cannot write such a letter. There are trainers that offer many different levels of training. One must educate themselves on what are the needs of the person desiring the animal. How do you select the animal and is that even possible? What are the expenses necessary to train the animal? If we train this animal, where are we allowed to take the it at the end of the program? The following link has an excellent chart describing the differences between service, emotional support, and therapy animals. The article is associated with a news team that realized how easy it was to turn a family pet into a service dog just through an online purchase. Of course that is not legal and is punishable by law if someone is caught passing their dog off as a service dog. There are very high standards and guidelines that must be followed with service animals. These requirements take a large number of hours in training and gaining experiences that can often times only be accomplished through programs like Paws and Effect, Puppy Jake, Guide Dogs of America, etc. Even in these programs sometimes up to 50% of the puppies that begin training never complete the training or retire early. The cost to train a dog in one of these programs can range from $10,000-$20,000 or more. The training can span more than 2 years depending on what tasks the animal is being taught. Attempting to adopt a dog or purchase a dog and start the training process yourself can be a great expense and at the end a dog may not have the skills or mental capacity to be a service dog. Often times a trainer agrees to help you train your dog but there is no guarantee that you will have a dog that can truly be a service dog for you or your loved one. Take time to look at this link and recognize the great challenges that lie before you and your pet. The investment in time and money will be substantial. The following link lists requirements of service dogs in public and will be a good source of information. If after reading this you are still interested in training your dog to be a service dog, emotional support dog, or therapy dog. A good place to start is working toward a Canine Good Citizen (CGC) award. A CGC award is for dogs that pass basic social and behavioral classes. There are 10 basic steps to this award. It is a noncompetitive test for all dogs and can be used as a prerequisite for therapy dogs. Some homeowner insurance companies and apartment complexes are looking to use these tests to encourage good manners in the dogs and teach responsible pet ownership to their owners. The following link gives you more information on what this CGC test is all about and what the test items are. This is a great place to start with any dog and if it receives this award then you are able to move forward with additional training and tasks. If it fails this CGC test then you need to realize this dog will never be anything but a very special pet that can give you great joy and happiness. This last link just points out the great injustice to those people who do have service dogs and how it affects them in their daily lives when others try to pass their pets off as service dogs. Please consider the danger of “Imposter Service Animals” to the general public. We need to protect the true service animals and their owners by keeping our companion animals only in public places that allow all pets. Pet Poison Prevention Awareness Month during March is fast approaching. It is always a good time to refresh our minds about common items that are a huge danger to pets. My goal this month is to encourage pet owners to pet proof their homes when it comes to some of these common products. The number of calls we get around holidays about pets eating chocolate is just one indication of how awareness is important at all times. We also see a rash of calls each fall about accidental rat poison exposure. As warm weather returns the calls can switch to outdoor exposures of new plants and shrubs that are available for chewing on. Every season or holiday has risks lurking for our pets. Stay aware and alert to what is in and around your home. Foods that we eat can be a problem for our pets. Chocolate is one that most people are aware of its toxicity to pets. Dark chocolate is more toxic than milk chocolate, but depending on the size of the pet and what volume they consume, symptoms can range from vomiting, diarrhea, hyperactivity, tremors, seizures, and even death. What people are not as familiar with is raisins, grapes, and currants causing irreversible kidney damage to our pets when ingesting even a small amount. Onions whether cooked or raw can cause anemia and only transfusions can save pets once this process of destruction begins. Raw bread dough can cause distention of the stomach and ethanol intoxication develops as the yeast ferments. Macadamia nuts can cause clinical symptoms of vomiting, weakness, depression, but has not shown to be fatal. Avocado fruit, leaves, stems, and seeds have all been shown to be toxic to multiple animals but less so for dogs and cats. There are a number of people who have hobby farms and may not be aware of its effect on the heart muscle or its ability to cause severe mastitis in lactating animals such as cattle, goats, sheep, rabbits, horses, pigs, etc. The following article has more information on risks to animals. Edibles and/or Medibles are cannabis infused, food products. Homemade or commercially prepared marijuana infused foods and drinks have increased the number of accidental pet poisoning by greater than 330% in the last few years. The following article is a great resource for anyone wanting to know more about this new risk to our family pets. If your pet has been exposed to THC (the active ingredient in marijuana) please contact your local veterinarian and tell them exactly what they ate and how much. The package from the product would be of great help if it is still available. Mouse and rat poisons are high on the list of items toxic to both dogs and cats that many people are very familiar with. In the last few years a new rat poison called Bromethalin has been replacing the previous poison called Brodifacoum. Bromethalin causes severe brain edema and affects the pets nervous system. It does not have an antidote like we have with Brodifacoum offering the Vitamin K to stop bleeding disorders. 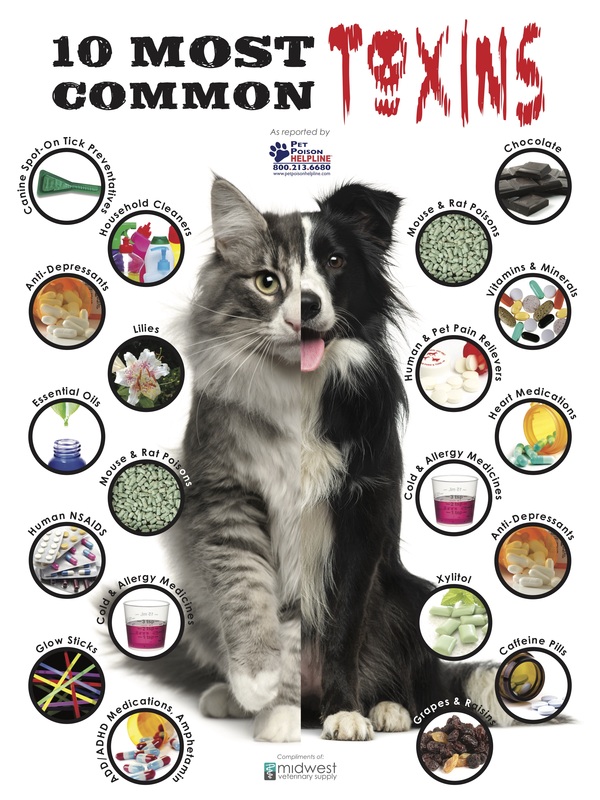 There are multiple products that contain these different poisons so make certain you know what you are purchasing and keep them away from pets. Including the dead mouse or rat to avoid any secondary poisoning situations. Indoor and/or outdoor plants are often a cause for concern for our pets. With Easter approaching it is important to keep all Lilies away from our pets. This link will take you to a sight to explore whether you have any plants that could be harmful to your pets. Be aware of any flowers delivered to your home since they are a source of curiosity for your pets, especially cats. Outdoor landscape plants such as the Yew plant, which is cardiotoxic to all animals, are important to consider as well. Unexpected death is often the first symptom seen when animals are exposed to Yew. Xylitol is toxic to your dog and this is one that is becoming more of a concern since we have a large number of products that contain it. Everyone knows chocolate is toxic but the risk with xylitol is even greater since the volume needed to cause death is much less. The article below describes in more detail the dangers with xylitol. It has a great photo showing the amount of chocolate verses the amount of gum it would take to kill a dog. Cats have not shown to be as sensitive to xylitol but I would still suggest avoiding consumption. Human medications are a huge concern for pets as well. The list is endless on how these medications can affect our pets. So often the accidental poisoning occurs when a dose is dropped or a bottle is not returned to a safe location. Please put all medications and daily pill dispensers in tightly secured locations where pets cannot chew or play with the containers. A purse or bag are not considered secure. If exposure has occurred please have the name and strength of the drug and an idea of how many may have been consumed and how long ago. This information can be helpful in determining the treatment and potential side effects. As springtime draws near we will once again need to protect our pets from fleas and ticks as we start enjoying the outdoors again. Flea and tick products can be a source of toxicity to our pets. This usually occurs because the wrong product was used on their pet. Most dog products are toxic to cats. Do not attempt to treat your small dog with just a drop of the large dogs’ flea and tick product. Avoid your pets ability to lick the area where the product was applied and from licking one another. You can remove most topical flea and tick products using Dawn dishwashing detergent. Then it is important to have your pet seen by your veterinarian if they display signs of vomiting, depression, tremors, seizures, etc. Pets are family and one needs to consider the importance of being aware at all times of what hazards are present in and around your home or that of family and friends. Pets should always be seen as toddlers when considering how to pet proof every location. If you ever find yourself wondering whether something is poisonous or not, or what symptoms to look for, the following link to the Pet Poison Helpline is a great source of information. If you need more advice they do work directly with you and your veterinarian for a fee. I hope spring comes early and we are able to have a warm and safe March, free from accidental poisonings. Growing up on a farm gave me insight to the circle of life at an early age. I saw crops planted and harvested each year to feed the hogs that were raised to supply food for the world and our immediate family. 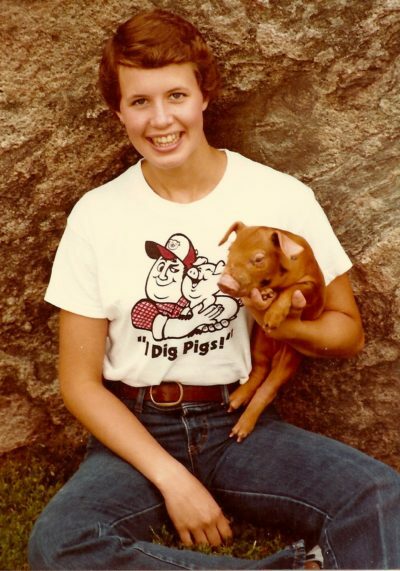 I was introduced to baby pigs as I helped my father give iron shots to prevent anemia and clip baby teeth in order to protect the mother sows udder. I was in charge of caring for the runts that were not able to fend for themselves in those large litters. My younger brother and myself would fix milk replacer for them and then transition them to creep feed and offer all the TLC a young pig could handle. I snuggled with pigs more than I care to admit during my younger years. The ones that did not survive were carefully buried behind the barn and we rejoiced with each one that was able to move to the feeder pig facility. I had a number of outdoor cats that would have litters every spring and those little kittens always seemed to get the “kitty cold” and would start doing poorly. My dad told me that if I wanted to help them, I could give them a shot of penicillin and see if they improved. Some responded immediately and others continued to decline and eventually passed away. Yet each of them were loved every moment of their lives by a young girl that learned there is a time to live and a time to die. I had farm dogs that worked side by side caring for the livestock and others that were there as protectors and/or companions. Attachment to each of them ran deep and as they aged, it became apparent that soon we would have to say good-bye. I guess you could say that all of these experiences set me up to be a veterinarian. These experiences also made me more aware of the circle of life. I saw life and death often in nature and realized that there is no fear in death. I would see the peace in an animal’s passing and that there was no longer any pain or suffering. I would remember the joy that they had brought to my life, even if it was only for a short period of time. I would realize that my life was blessed because they had been special to me. As I spend time with clients at Winterset Veterinary Center during the difficult moments surrounding euthanasia, I am reminded of the peace that comes in the end when our furry friends have taken their last breath. I can remember the joy they have brought to their forever family and know that these humans have been eternally blessed to have had this time with this special furry friend. Please understand that as a veterinarian, these situations are some of the most difficult parts of my job. Yet, I would not choose to be anywhere else when that time comes for a pet-owner. I have been with them during the good times, and I would never abandoned them during these final moments when facing the most agonizing decision they have ever had to make for their special friend. 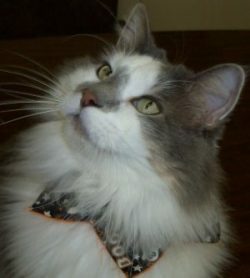 I find myself counseling often on “Is it that time?” Only you as a pet owner can know and decide if it is that time. People ask me, “But how will I know?” I tell them, “You will know.” We were given a greater intelligence to be able to sense pain and suffering. Maybe by using our 5 senses we can relate to the struggles they endure during those final days. No more twinkle in their eyes, lots of moans and sighs, lack of interest in food and water, avoidance of affection and interaction, and/or unusual smells. Maybe it is the physical challenges they face such as incontinence, nerve deficits, joint diseases, heart disease, etc. Sometimes these issues can present in combinations that make it apparent that successful return to a quality lifestyle will be next to impossible. We all can hope that one morning we awake and find our furry friend peacefully passed in the night. Yet I must say, that gift is not granted nearly enough. If you have been given that gift in the past count yourself BLESSED! I want to make certain my clients know that they will not be judged on what they decide is best for their furry friend. Only they can sense what has changed in their pet’s life that makes it apparent that this is the right time. I recall a day when I was asked to go outside to a pick-up truck to administer that final injection that would end the painful day to day struggles their furry friend had endured. I climbed up into the bed of the truck and sat in front of this very special dog that I had had the pleasure of caring for. No struggle was given as I placed my tourniquet and found that vein. I began injecting the solution and in her final moment of consciousness, she laid her head ever so peacefully in my lap. It was a moment I will never forget because I understood how much this final gesture had given her freedom from her pain and suffering. Our furry friends deserve to have their final days be full of love and attention to their every need and comfort. The unconditional love they bestow on us daily is something that we will always hold most precious and dear. If you are coming to an end in the life of a furry friend, just always keep in mind that quality is more important than quantity. If each day is a struggle for your pet and they are having more difficult days than good days it may be time. If the sparkle has gone from their eyes, they no longer greet you at the end of the day, and they rarely seek you out due to the constant struggle they have to get around, it is most likely time. Know there is peace in their passing and joy in the remembrance of the blessings they have been in your lives. My favorite saying when it comes to this topic is, “A furry friend’s only fault is they do not live long enough.” These words ring true for me and for all those who have had the pleasure of loving a pet.